Or, as the case may be, white cardboard box sealed securely with tape. As we have all been taught not to judge a book by its cover or, indeed, a parcel by its packaging, let’s talk about what was inside the exciting package that I was eagerly awaiting without really knowing what was in store for me… I am, of course, talking about February’s UK Vegan Food Swap! You may have already read about what I sent my randomly-allocated recipient, Anna, and although I really get excited about picking out treats for someone else, getting my box was even more exciting. Now I get excited about receiving pretty much any parcel, but the box of treats that Christine sent me got better and better as I pulled each item out of it. Although Christine doesn’t live very far from me, and although I have a weird habit of scouring shops for new vegan-friendly treats even when I have no intention of buying them, she actually managed to unearth a whole collection of items which I have never even seen before and yet which are totally right up my street! I got a handy pot of Morning Harvest Gourmet Oatmeal, which will be ridiculously useful for my early meetings or even just those late mornings on days off when I want to head straight out the door but don’t want to have to buy food while I’m out (or break my fast on a chocolate bar, not that I have ever ever done that). Seeing that I am slightly obsessed with chocolate, Christine thoughtfully popped in a couple of bars of chocolate from Le Pain Quotidien – Earl Grey and Pink Peppercorn, which sound delightful! I can’t wait to try these out and add them to my list, and I’m very intrigued by the fact that I can’t even seem to find these online! 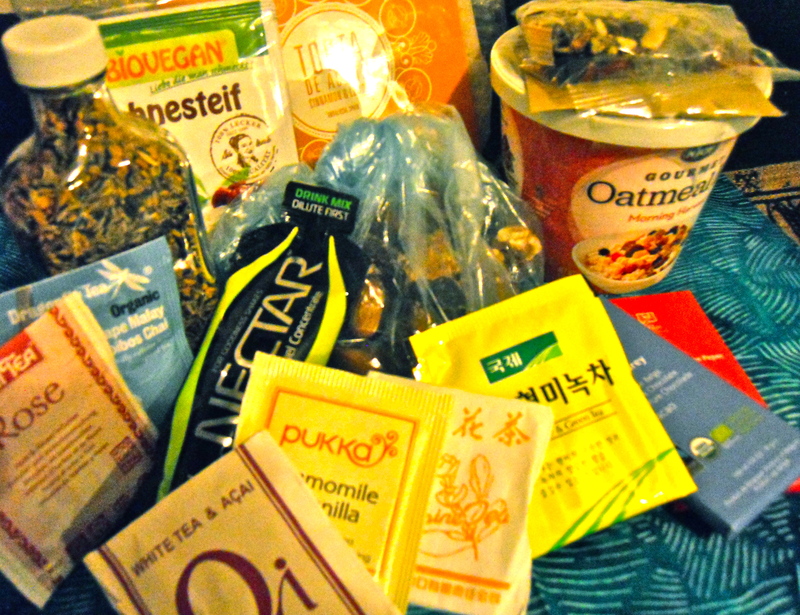 I got a lovely little selection of various teas, white and green and rooibos and herbal… Everything I could ever want, and again, nothing that I have tried before! I have already had the Qi White Tea & Açai which was tasty, refreshing and relaxing. I’m really excited by the Nectar Sports Fuel Concentrate, a sports drink mix which I have never seen before. I really rate electrolytes, but rarely use sports drinks as I consume enough sugar as it is, and they are expensive. However, I do think they are really handy, and it will be nice to not worry so much about my food intake right before training (enough carbohydrate, easily digestible, the right amount of time beforehand, etc) by taking this. It has really handy instructions for dilution as well, depending on what sort of concentration you might need for your type of training or event. Might use this tomorrow or Sunday, actually, when I have earlier training sessions. Also really excited by that adorable little bottle of home-blended whole spice mix – so thoughtful and exactly what I need to steer me away from store-bought mixes and pre-ground spices! Intrigued by the little sachets of Biovegan Sahnesteif a.k.a. cream thickener – basically a concoction of cornstarch, potato starch, and sugar – which should give me a good starting point for some innovative vegan baking. Another new one for me is the packet of cinnamon and lemon Tortas de Aceite, crispy thin biscuits. As someone who is increasingly craving crunchy, delicately flavoured snacks, this should really hit the spot. Just need to remember to bring them to work which is when I am most likely to reach for the snacks (and they’ll make ideal desk-and-computer snacks I should think!). Lastly, but most certainly not least, Christine sent me a bag of her homemade trail mix – I’m not sure how she knew that “unconventional” (her words, not mine!) is what really gets me excited, but this mixture of savoury roasted lentils, almonds, peanuts, raisins, and chocolate-covered nougat really makes my tastebuds tingle. My mouth is watering just writing about it! Thank you so much Christine, for putting a smile on my face (and delicious food in my mouth) this February! And to everyone else, if this hasn’t convinced you to take part in the UK Vegan Food Swap yet, just give it a try, sign up now and give yourself something to look forward to in March!